Most common health problems in Irish Terriers, plus health care and feeding. If you want to AVOID health problems in your Irish Terrier, you'll find my health care program very valuable. If your Irish Terrier already HAS a health problem, I'm sorry to hear that. You should immediately begin my health care program, and you may be able to restore his good health – or at least make him much more comfortable. Let me help! I can't give you statistics on the incidence of health problems in this breed because the majority of Irish Terrier breeders have decided not to test their breeding stock for inherited diseases. So all I can say is, "Be cautious." Orthopedic diseases such as hip dysplasia and luxating patella (loose knee joints) occur in similar breeds with similar ancestry. Eye diseases such as progressive retinal atrophy and cataracts can cause blindness. 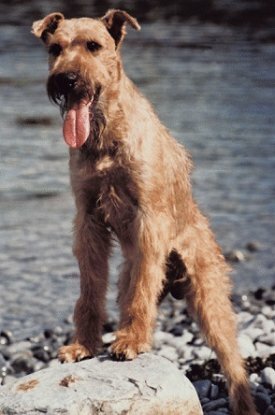 An inherited kidney disease (cystinuria) is a real concern in Irish Terriers. Chronic allergies cause itching and scratching that can lead to skin infections. Digital hyperkeratosis is an inherited disease in young Irish Terriers, where the footpads become thickened and cracked/ulcerated. This condition is painful and usually persists for life. Some health problems are inherited. For example, if both parents of your Irish Terrier have certificates proving they were tested and cleared of hereditary eye diseases, your Irish Terrier has less risk of developing those conditions. Other health problems can be prevented, or partially prevented, by the ways you raise your dog. If you're serious about doing everything you can for your Irish Terrier, my best-selling book, 11 Things You Must Do Right To Keep Your Dog Healthy and Happy, shows you how to raise your Irish Terrier puppy (or adult dog) in all the right ways. It will help you be your dog's health care champion! Read my advice on daily health care so your Irish Terrier lives a long, healthy life and seldom needs to see the vet. How many vaccinations does your Irish Terrier puppy really need? Does your adult Irish Terrier need yearly booster shots? The vaccination guidelines have changed! Find out what some vets aren't telling you.